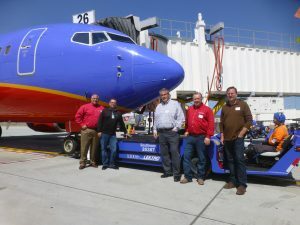 LEKTRO reached a milestone recently when Southwest Airlines took delivery of the 5,300th towbarless tug built by the manufacturer. Southwest duly placed the tug into service at its San Jose operation. To date, LEKTRO has produced more towbarless aircraft tractors than any other manufacturer in the world. The tug, a Model AP8950SDB-AL-200, is the company’s second largest pushback model, and capable of handling aircraft up to 210,000 pounds: this includes the Boeing 737 that Southwest Airlines utilises. The model was introduced in 2014 at the request of airlines for a tug that was certified to handle both the B737 and A320 families of aircraft. Earlier, Southwest Airlines had honoured LEKTRO as its 2016 Equipment Provider of the Year. Air Canada has announced that it is to open a Maple Leaf Lounge at Saskatoon’s John G Diefenbaker International airport this autumn. This will be the airline’s seventeenth such lounge in Canada. Air Canada’s Maple Leaf Lounge at Skyxe Saskatoon airport will be located after security, near to Gate 5. Encompassing 137 square metres, it will have a seating capacity for 40 customers. Work has already started on the project.